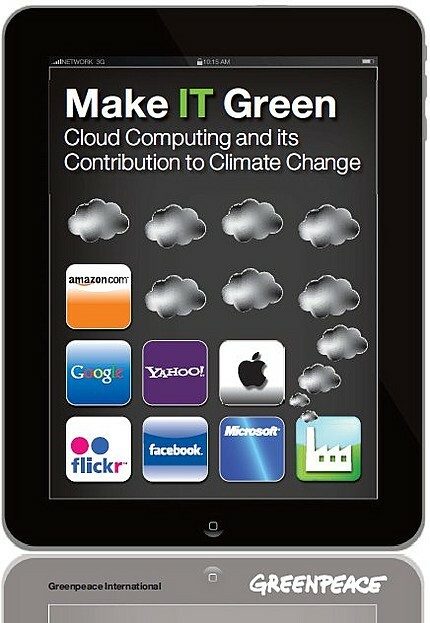 As cloud computing-fueled devices like the iPad grow in popularity, so will associated greenhouse gas emissions, according to Greenpeace’s “Make IT Green” report. The report, which dubs 2010 the Year of the Cloud, offers up a disturbing statistic: Cloud computing greenhouse gas emissions will triple by 2020. The increase in emissions makes sense. As we increasingly rely on the cloud to store our movies, music, and documents, cloud providers will continue to build more data centers–many of which are powered by coal. Facebook, for example, recently announced that is building a data center in Oregon that will be powered mostly by coal-fired power stations, much to the chagrin of groups like Greenpeace. The solution to the cloud computing problem is fairly obvious. Greenpeace explains in its report, “Companies like Facebook, Google, and other large players in the cloud computing market must advocate for policy change at the local, national, and international levels to ensure that, as their appetite for energy increases, so does the supply of renewable energy.” As we’ve noted before, companies like IBM, Google, and HP have already begun to make strides in cutting data center energy use. But there is still plenty of work to be done–as it stands, the cloud will use 1,963.74 billion kilowatt hours of electricity by 2020.